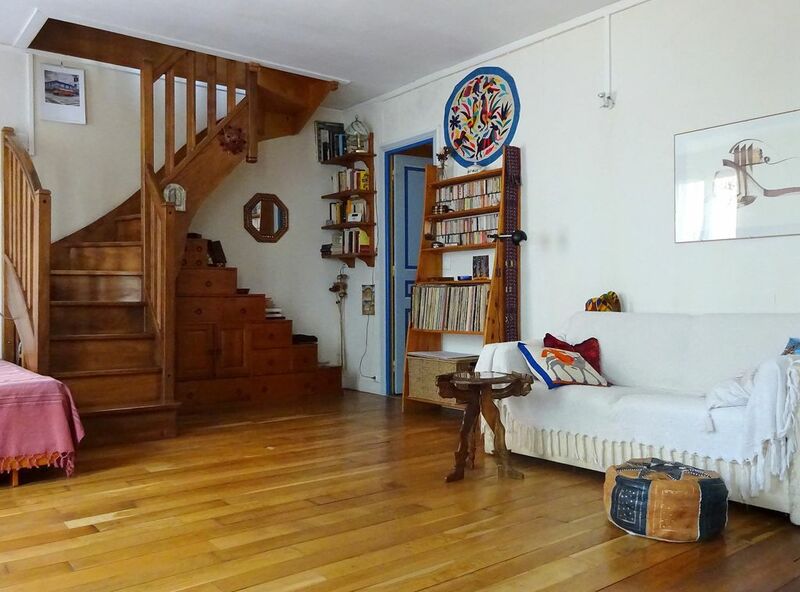 Very peaceful flat located in a pleasant area of Paris. Easy access to Metro and Buslines to city center (about 15 mns. by bus). This two-stoyered flat have two independant Bathrooms/WC and two kitchen. Comfort AND space: a rare commodity! Helene, the apartment’s owner, could not have been more helpful or more accommodating throughout the process, from start to finish. Gabrielle, Helene’s neighbor, greeted us and let us in, checked to see how we were doing, and rescued us with a phone call in an emergency. You simply could not ask for more or better from Helene in every possible way. He apartment is located some 4-5 blocks from the nearest Metro, on a steadily mounting hill. It is a climb; not terrible by any means, but a person with impaired walking or breathing might find it more than wanted. The living room has a two-seat sofa, and that’s it for comfortable sitting space; the rest are hard, wooden folding chairs. The room would g benefit from 2-3 easy chairs for reading, for conversation, for relaxing, and there is more than sufficient space for such. The apartment is situated on what an American would consider the second floor, that is, one flight of stairs up from the ground. The stairs between the first and second floors of the interior of the apartment itself are extremely narrow and steep and curving. Again, if anyone has mobility difficulties, the stairs could be problematic. The neighborhood is delightful, with grocery stores (large and small), barbers, beauticians, pharmacies, bakeries (one less than one half block up from the apartment! ), pastry shops, clothing boutiques, etc. etc. There’s a little bit of everything right at your hand on the very street! There is an open-air market twice a week, Tuesdays and Fridays. If you like the atmosphere and the traffic of a bazaar, you’ll be thrilled. It features essentially fresh food (vegetables and fruits and meats [including whole goats’/sheep’s heads!!!]) along with smatterings of clothing, household goods, jewelry, etc. Once you have mastered the Metro system (and it’s not that hard), you have the entire city at your disposal. A one-way Metro ticket currently costs $1.90 (but if you buy a “carnet,” a packet of ten tickets, the price drops to $1.49). A readable map with the Metro system clearly marked is essential. I’d suggest a small red covered book (currently costing 8.90 Euro), which gives Metro lines, streets, railroad lines, and neighborhoods (arrondissements) with most streets. I find it invaluable. It’s called: Paris Classique, L’Indispensable. Be sure to speak with the owner, Helene, about a problem with the lock on the apartment’s main door; she was to have it fixed right after we left; just check to be sure. überlaufen, aber mit der Metro oder mit dem Bus ist man ja sofort überall. Alles in allem ein sehr entspannter Aufenthalt. Ampio, arioso, soleggiato, silenzioso--sembra di essere in campagna ma dalla via si vede Beaubourg. Quartiere multiculturale e mezzi comodissimi. Appartement bien situé et quartier agréable. Manque quelques équipements adaptés à la location. Accueil et proprio sympa et très gentil de nous accueillir à une heure tardive. "El apartamento estaba muy bien, quizás nos faltaron platos y menaje para cocinar, hay que caminar un poco para el metro mas cercano pero vale la pena." Visitors will find many restaurants, bars and stores in the neighborhood. But they can also find quietness in the parks and discover the touch of old Paris walking around on little streets. Tarif dégressif en fonction de la durée. Supplément chauffage selon la saison, Caution demandée, acompte/arrhes à la réservation, remise des clés par le propriétaire. Frais de ménage.